Tiverton Harriers have got 2017 off to a flying start so there is a huge amount to report on for January, from the fast and flat road racing to fell running, team events, cross country and night running! Terry Fullick has been taking part in the Minehead Seafront 5k Series and the 4th round took place on Wednesday 4th January. Terry ran a PB with a time of 25.55 placing him 2nd MV50. Fantastic progress Terry. 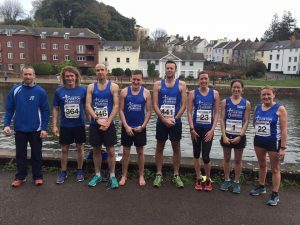 This was the first race in the 2017 Instep Devon Championships and the results placed the Harriers in 1st female team place and 2nd male team place. The remaining Championship Races can be found here. Meanwhile, also taking place was the Stoke Stampede, a road race over quiet country lanes in Stoke St Gregory, Somerset. The course is mainly flat but has some interesting rise and falls spread over the course. Jeff Curd completed the course in a brilliant 48.24. Jeff’s running has gone from strength to strength over recent months and the PB’s keep coming – fantastic running Jeff. Finally, also taking place on this day were the South West Cross Country Championships. Lauren Burd ran in the U17 Womens race, in 16.46 placing her 31st. Well done Lauren. Several Harriers had their head torches at the ready on Saturday 14th January for the Haldon Night Run 5k and 10k. Simon White ran in the 5k in a time of 17.38 placing him 2nd overall, also running in the 5k was Alan Ledger who came in 5th place in 19.56. Taking part in the 10k race was Jeff Curd who ran in 55.14 and Luke Holway who ran in 70.00. Great running chaps. Great results and a fantastic weekend’s racing from Simon! 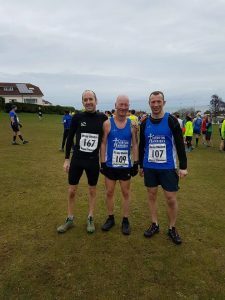 The 4th in the series of the Westward Cross Country League also took place on Sunday 15th January, this time at Westward Ho! Ben Stone was the only senior man flying the Harrier flag and he finished 47th overall in 38.11. George Stone ran in the U17 Male race in 24.11 which put him in 10th place. The next race in the series takes place on Sunday 12th February in Stover, details here. 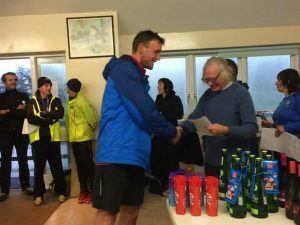 There was plenty of off road action on Saturday 21st January firstly with James Morrisson taking part in the Craig Yr Allt Fell Race which you can read all about in James blog here. We also had Richard Kemp taking part in the Blackdown Beast, a 16 mile self navigated, multi terrain social run which offers hot pasties and mulled cider at the half way point. The run starts and finishes in Dunkeswell and takes in Smeatharpe, Upottery and Luppitt. Richard Kemp and Luke Holway were back to night running on Saturday 28th January taking part in the Moonlight Flit 10k at Totnes. The course was mainly off road and involved some tough climbs. Richard coming in at 58.21 and Luke at 1hr 23. Sunday 29th January saw the South West Vets Athletic Club Cross Country Championships which took place in Sidford. Well done to Ben Stone who finished the very muddy course in 3rd overall and first in his age group (35-39). Congratulations Ben. On the same day a new race, the Green Circle Half(ish) marathon took place in Ide near Exeter. This was a self navigated team event around Exeter’s Green Circle. 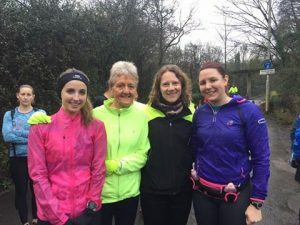 Well done to Kirsty Manley, Hannah Brown, Ruth Hyland and Mary Humphries who ran in the Tiverton Harriers team and successfully completed the course without taking a wrong step in a time of 2.25.32. And that rounds off the month. Well done to everyone who raced in January, such a variety of running with some fantastic results and many PB’s.